Mix dry ingredients in larger bowl. Mix wet ingredients together and add to dry ingredients, mix lightly. Batter will rise a lot. Let set for a few minutes. If batter gets too thick, add some milk to thin it. I usually double or triple this for us. You can add anything to the batter.... My daughters usually add chocolate chips, since they are not too fond of syrups. 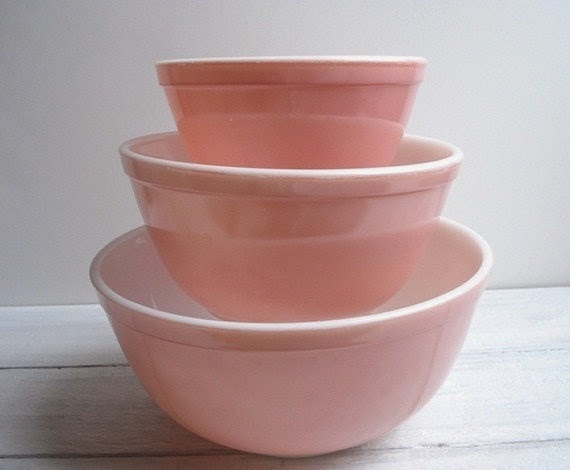 Beautiful set of nesting bowls. Made someone a happy baker! My daughter Stephanie is the pancake expert in our family... since she got married, I don't think anyone has made them at our house since. We go over to her house so she'll make them for us. Breakfast for dinner happens a lot at our house. Since I am not a huge breakfast person and hate to cook in the morning, I make it an effort to just cook breakfast for dinner several times a month.